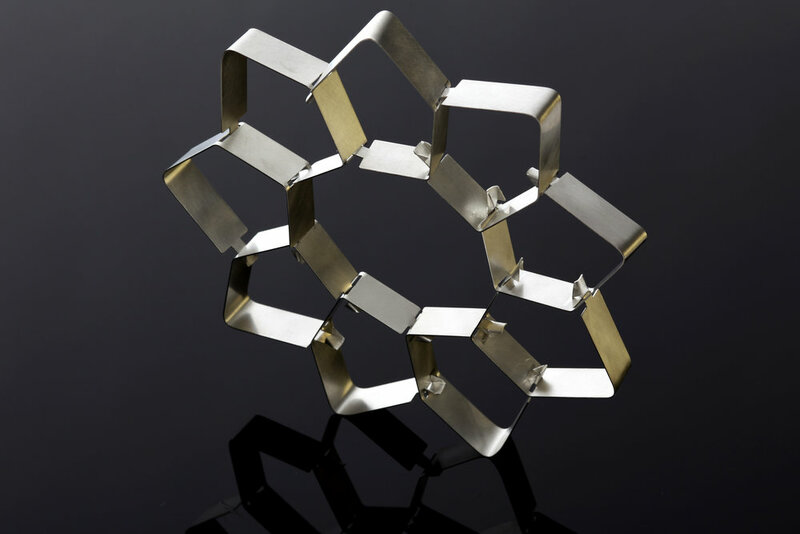 Made from sterling silver this geometrical piece is a part of Anna Maria’s bespoke collection. 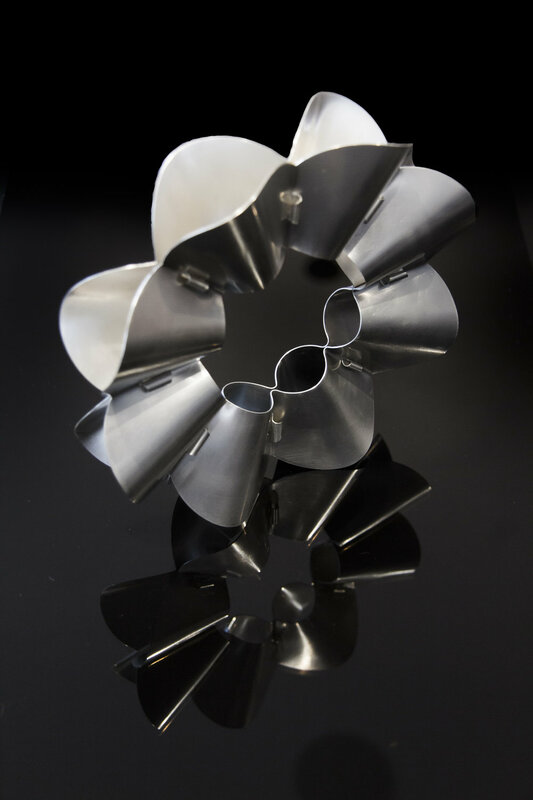 Inspired by the Arctic Poppy, a flower that blooms in the harshest of conditions, the piece is assembled by cold connecting eight separate parts to create the suspension of form. This modern piece blends the soundness of structure with the lightness of natural order. Made from sterling silver, this intricate piece is a part of Anna Maria’s bespoke collection. Inspired by a wild reindeer’s vertebrae, the necklace is assembled by cold connecting twenty six separate parts, emulating the animals spinal structure – creating a interconnecting spiral which fuses form and functionality. 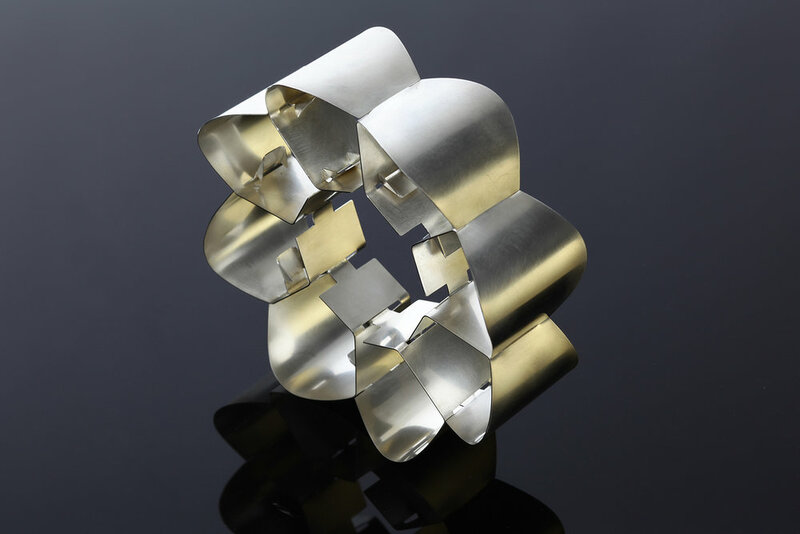 Made from gold plated sterling silver, this piece is a part of Anna Maria’s Migration Collection. Inspired by migrating bird formations sweeping the sky, each silver or gold bird is fixed onto a circular plate, creating a dimensional arial movement flowing above the surface. 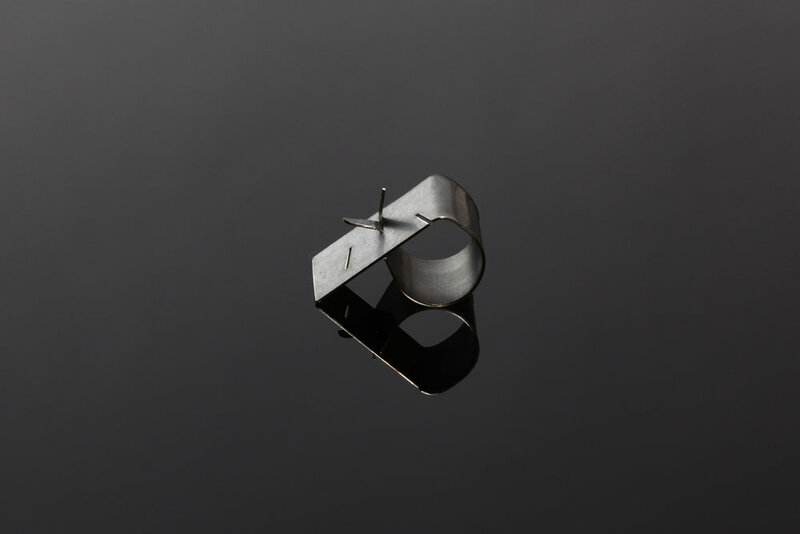 Made from sterling silver, this collection of cold connected rings is a part of Anna Maria’s Migration Collection. Each ring, handcrafted by the artist, incorporates a clean slate, a flying bird or an abstract promise thereof, creating dimensional movement in each and every piece. A bracelet inspired by the Icelandic Twin Peaks basalt rock formation, with layers overlapping into a sleeve-like multiple. Inspired by forest tree crowns, this large piece is assembled by fixing silver leafs to a bracelet base.